ANDREW is a highly experienced solicitor with over 26 years’ experience in the areas of commercial law, employment law, banking law and litigation generally. Andrew has acted for both buyers and sellers of companies, some of which have been very sizable transactions, including in the summer of 2018 acting in the sale of a highly profitable financial services business. Since 2002 Andrew has built up a large store of knowledge and experience in this area acting in the sale and purchase of more than 30 practices. Andrew has drafted and negotiated numerous commercial agreements over the years including agency agreements, franchise agreements, distribution agreements, service level agreements, supply agreements, manufacturing agreements, services agreements, expense sharing agreement, partnership agreements to name but a few. Andrew has advised extensively in relation to internal re-organisations of companies including inserting holding company structures, share for share exchanges and advising generally on the requirements of the Companies Act 2014 in relation to same. Andrew has year advised both employees and employers in the area of employment law and his work in this area includes negotiating with the employers’ solicitors mutually acceptable severance packages for such employees in circumstances where the employer no longer wishes them to remain in the company and the reasons for seeking to terminate their employment may be somewhat contrived. He has taken cases before the Workplace Relations Commission in the areas of unfair dismissal, equality claims and breaches of the Organisation and Working Time Act, some of which ended up on appeal in the High Court on a point of law. He has also advised employers in terms of drafting Contracts of Employment and Staff Handbooks and various policies and procedures and has also advised generally with regards to Data Protection legislation and in particular the new GDPR requirements as of the 25th May 2018. 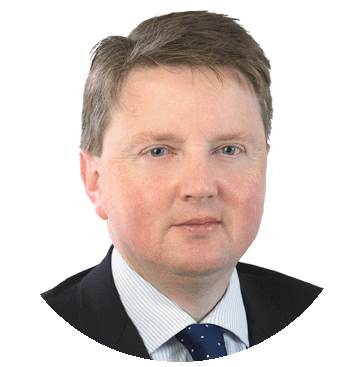 Andrew has acted for financial institutions in terms of taking and reviewing security and advising generally in relation to enforcement and, in particular, in relation to the appointment of Receivers over property, and to a lesser extent, companies. Sometimes some of these enforcement cases ended up before the High Court seeking injunctive relief. Andrew has also over 25 years litigation experience from debt recovery actions in the District, Circuit and High Court to company law oppression cases, neighbour disputes, shareholder disputes, breach of contract actions, employment law injunctions, judicial review applications, etc. “Legal Aspects of Investment Based Crowdfunding”; Lexis Nexis, Chapter 3 of “Doing Business in Ireland”: 2019 (release 30); “International Trade in Goods and Services in Ireland: Overview”: February 2019 Practical Law (Thomson Reuters); “Sale and Storage of Goods in Ireland: Overview”: February 2019 Practical Law (Thomson Reuters).